Welcome to ‘Open for Debate’, a blog associated with the project Changing Attitudes in Public Discourse. We hope to use this space to debate all aspects and forms of debate. Ultimately, we would like to develop together, in the spirit of collaboration, some suggestions to improve the quality of discussions in public life. These strategies will aid debaters in their rational evaluation of both their own and their critics’ views, as well as promoting respectfulness in conversation. We will explore whether inclusive debating communities may develop views that are more likely to be true than the conclusions reached by homogeneous groups and we will consider why arrogance, closed-mindedness and dogmatism are obstacles to good debates. From gossip, conspiracy theories, rumours, protests, formal debates, discussion threads on social media and more, we look at the many ways in which human beings carry out conversations and disagree with each other as a way of figuring things out and expressing values and convictions. We shall post regular entries on a range of topics every fortnight. We hope that these posts will generate debates hosted by the blog. Please use the Leave a Reply function to participate in the debate or to suggest topics. We will not allow anonymous posts and we shall approve posts before they are publicly available. We will do so to ensure respectfulness in debate. But if you think that this may be censorship, please leave a reply and start the debate! Finally I would like to take this opportunity to acknowledge and thank our funders, Humility and Conviction in Public Life. This blog was supported by a subaward agreement from the University of Connecticut with funds provided by Grant No. 58942 from John Templeton Foundation. Its contents are solely the responsibility of the authors and do not necessarily represent the official views of UConn or John Templeton Foundation. 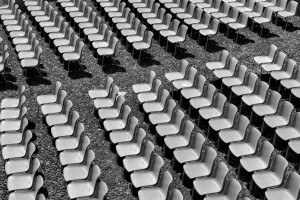 ‘empty audience‘ by Edwin van Buuringen is licensed under CC BY 2.0.